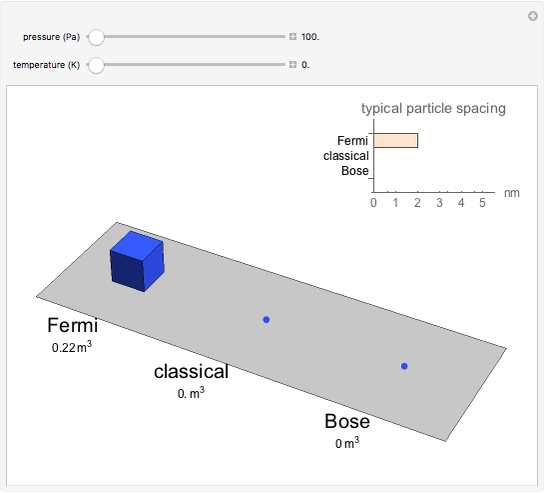 This Demonstration computes as functions of pressure and temperature the volumes of ideal gases obeying Fermi–Dirac, classical, and Bose–Einstein statistics. 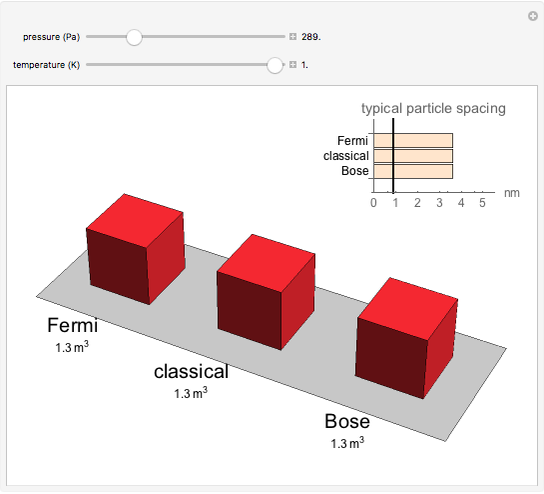 The inset bar chart indicates whether quantum effects are significant by comparing the typical spacing between gas particles with their thermal wavelength , indicated by the vertical bar and a tooltip. An ideal gas consists of noninteracting point particles. The three ideal gases shown in the Demonstration consist of: (1) spin-1/2 fermions; (2) distinguishable particles; and (3) spin-0 bosons. These cases are governed by Fermi–Dirac, classical, and Bose–Einstein statistics, respectively. Each gas consists of particles. A classical gas with this number of particles occupies one cubic meter under standard conditions of 0 °C temperature and one atmosphere ( ) pressure. The point particles in the three gases all have the same mass, taken to be equal to the mass of a helium-4 atom. These noninteracting particles each occupy zero volume and thus differ from physical atoms or molecules. At high temperatures or low pressures, the volumes of the three gases are nearly the same. At low temperatures and high pressures, the volumes differ due to quantum effects. For fermions, the Pauli exclusion principle leads to a finite volume for a Fermi–Dirac gas at zero temperature. For bosons, on the other hand, we observe an abrupt condensation of the Bose–Einstein gas into its ground state, which, in principle, occupies zero volume for point-like molecules. Quantum effects are significant when each particle's thermal wavelength, , is comparable to or larger than the typical spacing between particles, , where is Boltzmann's constant, is Planck's constant divided by , is the particle mass, is the temperature, is the gas volume, and is the number of particles in the gas. K. Huang, Statistical Mechanics, New York: John Wiley, 1963. Tad Hogg "Compressing Ideal Fermi and Bose Gases at Low Temperatures"